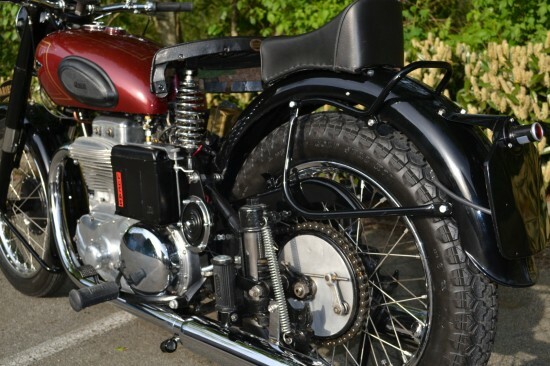 The motorcycling industry prior to the 1960’s was centered on single and twin-cylinder machines, and, at a time when simplicity equaled reliability, Edward Turner’s compact four-cylinder design would have seemed extremely exotic. Prior to the Lancia Aurelia’s introduction in 1950, car and motorcycle engines used “inline” formats almost exclusively, and although inline fours work fine in automotive applications, they can cause packaging, as well as cooling, problems in motorcycles. 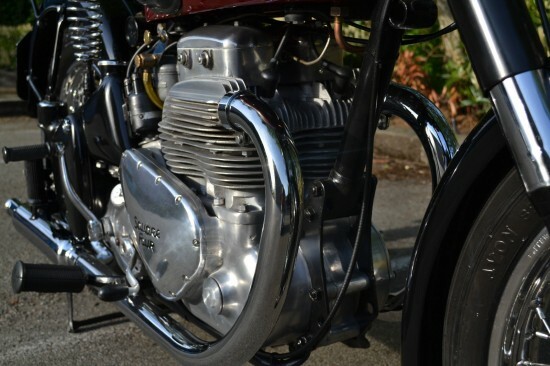 Originally rejected by BSA, the unusual square-four design found a home with Ariel and featured a pair of parallel twin blocks siamesed with their transversely-mounted cranks geared together and sharing a common head with overhead cams. This compact design allowed a four-cylinder powerplant to be fitted in to frames that were normally home to engines with one or two cylinders. The original 500cc engine was eventually enlarged to 601cc’s to increase torque for riders who wanted to fit a sidecar to their machines, but the OHC design had a propensity for overheating the rear pair of cylinders, as cooling airflow was blocked by the front pair. The engine was completely redesigned in 1937 with pushrod-operated overhead valves and a big displacement increase to 997cc’s. 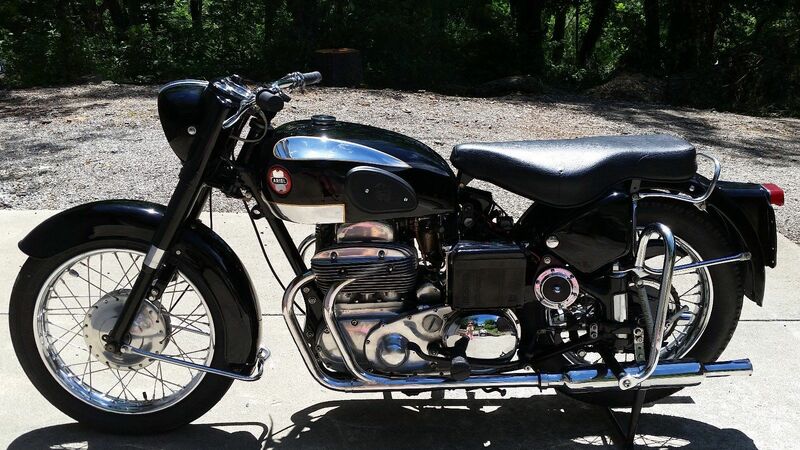 Aluminum replaced iron in the head and cylinders in 1949 for a significant savings in weight, and the final iteration of the engine introduced in 1953 was distinguished by four separate exhaust pipes exiting the head, although this example is the earlier, two-pipe version. 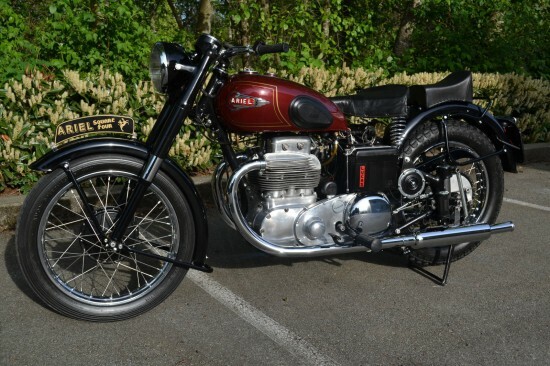 An English country cruiser capable of 100mph…. Gaining popularity as “the poor man’s Vincent”, the Square 4 is steadily increasing in value. 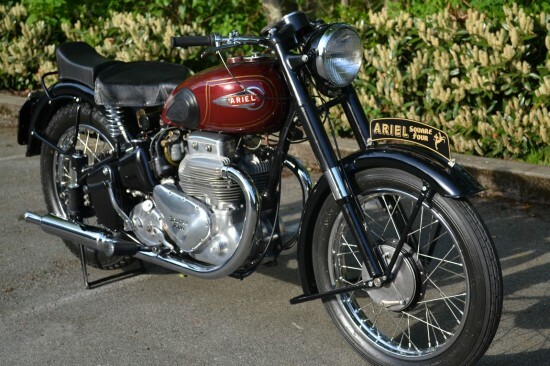 The current owner is the fifth (first not named David) in a line that traces this 52 Ariel Square 4 Mk I’s origin to New Jersey; where it was purchased new in 1952. The most recent previous owner bought the bike while on a trip in N.Y. State in 1996. After the purchase he had a full restoration performed prior to displaying in his collection. Upon receiving the machine, the current owner kicked it over twice and it started right up and ran nicely. 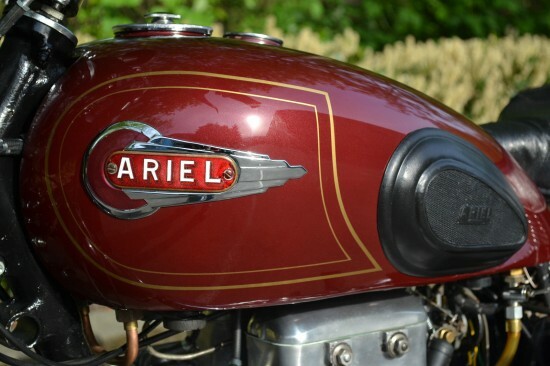 He rode it around his neighborhood for an hour, and then carefully decommissioned the Ariel for display in his collection. The odometer shows 56,818 km or 35,305 miles. The current owner has done a fair bit of detail work on the machine since acquiring it – much polishing, inspecting, cleaning and servicing inside external cases etc. He removed and cleaned the oil tank & lines and installed a rebuilt exchange oil pump from Dragonfly. The frame is refinished but not powder coated and makes it look very authentic. The tins are all superb in that they are original but refinished beautifully and correctly. Chrome is all perfect. All of the wiring was redone correctly and everything works. Even the tiny light in the speedo and the brake light. (all the lights work in other words) The bike includes the original ignition key and the (optional?) jiffy side stand. The owner is in possession of a dating certificate with an extract from the Ariel Works Ltd. despatch record books confirming that all of the major components on the machine are original. With the exception of perhaps the rims, tires, spokes and buddy pad this bike has all of its original pieces, nicely and carefully restored. 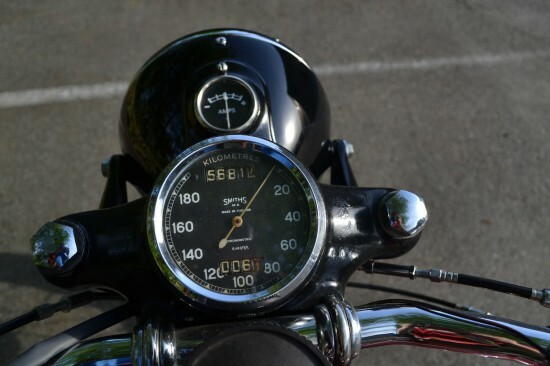 Also included in the sale are the original owner’s manual signed by the first two owners and a copy of the 1970 NY State vehicle registration bearing the name and signature of the second owner who purchased the bike from his friend and original owner in 1957. 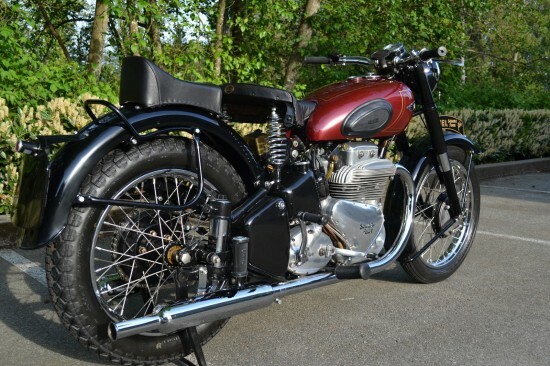 Weight was relatively low for such a complex machine and the bike could top 90mph, no small feat in 1950, although maximum performance wasn’t really the point, since lighter, simpler singles like the BSA Gold Star could match those numbers. It was the square four’s smoothness and sophistication no twin or single could possibly match that was the source of the bike’s lasting appeal, with production lasting from 1931 until 1959. This example is in excellent condition and appears to be well-documented. Bidding is north of $22,000 with plenty of time left on the auction. The popularity of some bikes will naturally rise and fall with prevailing trends, but Square Fours have been steadily appreciating in value for some time now, and looking at this bike, it’s easy to see why.